A team of researchers from the University of California, Berkeley, and the Keck Graduate Institute of The Claremont Colleges have developed a handheld device that can be used to diagnose genetic diseases quickly at point-of-care. 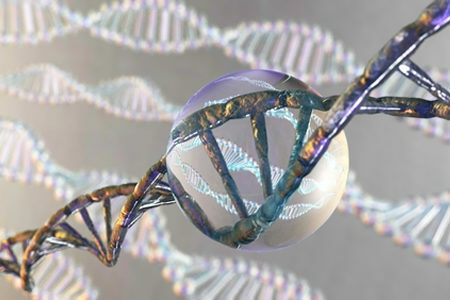 The device uses a combination of the CRISPR-Cas9 gene editing tool to identify genetic mutations and electronic transistors that detect when a mutation has been found. When a specific mutation is identified, an alert is generated which informs the physician of the diagnosis. The device does not require amplification or replication of DNA segments using a polymerase chain reaction (PCR), which is a time-consuming step in genetic testing. Without the need for PCR, genetic tests can be performed using the device without having to send DNA samples to the lab. That means genetic tests could be conducted in doctor’s offices or even in patients’ homes. The device has been named CRISPR-Chip and all that is required is a good DNA sample. A sample of cells could be taken at a patient’s bedside, the DNA could be extracted, and added to the CRISPR-Chip to check for a specific DNA sequence. A CRISPR-Chip could be developed to test for a number of different genetic mutations and could serve as a bedside assay. The CRISPR-Chip uses a deactivated Cas9 protein which is bound to graphene transistors. When a specific section of DNA is located, the Cas9 enzyme binds and causes a change in the electrical conductance of the graphene. That change can be measured, triggering an alert on the handheld reader. If the specific section of DNA is not present, no binding occurs, and electrical conductance remains the same. The CRISPR-Chip was made possible due to the high sensitivity of graphene transistors and the specificity of the binding of Cas9 to very specific sections of DNA. That enabled the researchers to eliminate the need for PCR. The CRISPR-Chip was developed to test for two genetic mutations that cause Duchenne muscular dystrophy and the test can provide a result in less than an hour. The researchers are now working on a new version of the CRISPR-Chip that can be used to test for multiple genetic mutations and infections. For that, they need to incorporate the appropriate sections of guide RNA (gRNA) that tell the Cas9 enzyme where to bind and multiple graphene transistors. In theory, a single device could be used to test for hundreds of thousands of genetic mutations simultaneously. In addition to serving as a valuable tool for use in diagnostics, the technology could have other uses, such as for quality control for companies that are developing CRISPR technologies for therapeutics. The device could help them evaluate the effectiveness of their CRISPR technology.